Part two of our Valentine’s Day excursion was something I knew J would like. 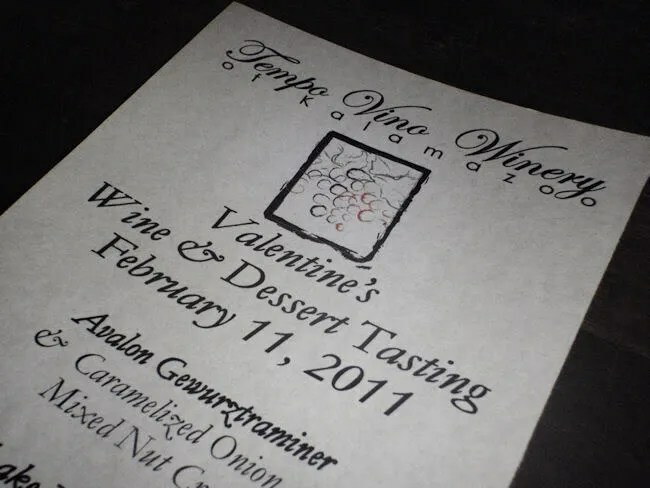 Tuesday night, not long after making reservations at Bold, I saw a tweet from Tempo Vino Winery for their Valentine’s Night of Sweetness Wine & Dessert Tasting. I showed it to J and she picked up the phone and called right away to get a reservation. After our fantastic dinner in Texas Township, we headed back to downtown Kalamazoo. We were pretty early so we drove around looking for a new restaurant J saw a few weeks ago. We never did find it, but it did kill enough time. 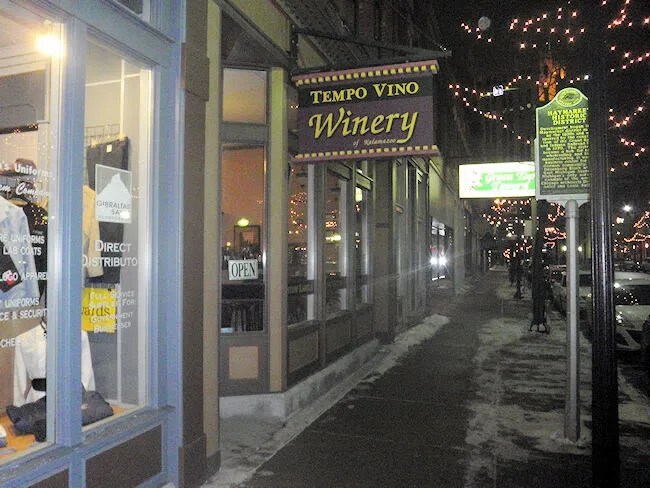 Tempo Vino Winery is on busy Michigan Avenue in Kalamazoo’s Central Business District. There is street parking in front of the buildings, but your best bet is to find a parking lot or ramp. We went to the lot on Bates Alley behind the building. There is an entrance to the business from the back, but we didn’t know that or even if it was open because they were using the area by the door for the event. We walked all the way back around to the front just because it looks like the proper entrance. We really weren’t sure how this whole evening was going to work. The event ran from 8:00 to 9:00 PM. I think we both thought it was going to be a sit down type event where they served each wine and dessert to the whole group at one time. That’s not how it worked. Instead, there were two stations set up with three wines and desserts each. You went at your own pace and kind of mingled throughout the space. We showed up a little before 8:00 because, again, we didn’t really know how the night was going to work. Still, even though we were fifteen minutes early, we were welcomed into the tasting area. They took J’s coat and found our reservation. We hadn’t paid yet, so I took care of that. The cost was $45 for both of us. After taking care of that little business, we were handed two wine glasses. They explained how the tasting worked and we were free to start anytime. Tempo Vino is a unique space in downtown Kalamazoo. I’ve walked by it several times, but not being a wine drinker, didn’t have a whole lot of interest. I guess I always assumed it was somewhat of a wine bar where they sold other people’s wine. I have no idea why I thought that, but it was completely the wrong impression. 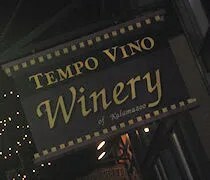 Usually you see winery’s outside of towns, so Tempo Vino being right in downtown Kalamazoo threw. The space is set up in to two rooms. The main room and the room where you would be most likely spend your entire visit on a regular day has a nice large bar as well as a couple tables. The rest of the space is filled with display racks for their bottles and they also have big production bottles scattered throughout the main room. The first stop on our wine tour was actually the back room. They had a large folding table set up where you could sit down for a few minutes. Near the back door, was another table and a server. The first wine on the menu was the Avalon Gewurztraminer. It’s a white wine that is a little fruity and a little spicy. It was paired with a Caramelized Onion and Mixed Nut Crostini. All the desserts were prepared by Confections Bakery which got us both really excited. The thing is, I don’t really think of fruit and especially don’t think of onion when I think of desserts. I was really hoping for more chocolate which was almost non existent in this dessert tasting. Still, I wanted to try everything and even though I really don’t like onions, I took a bite of the crostini. Wasn’t really my thing, but I did actually really like the wine. Pairing number two was the Lake Michigan Shore Chardonnay and Gala Apple Tartlet. The dessert was a big improvement over the first one. It had a very strong nutmeg flavor and a smooth gala apple puree. The wine is an un-oaked Chardonnay with a flavor or ripe pears. I again was surprised that I could not just stomach the wine, but actually enjoyed it and could have drank more. The third pairing, and final of the whites, was the At Last Harvest Viognier with an Apricot and Winter Spice Tartlet. The dessert was similar to the Gala Apple Tartlet and had the same nutmeg flavor. I was hesitant to try this one because I don’t like apricots and I really just wanted chocolate, but J talked me into it. The wine is a dry white. I don’t usually like dry’s, but this one didn’t bother me. It was good, but not for my palate. I prefer more sweets and we’d get back into that at the next station. On our way to the front to get to the next table, there was a tray of meats and cheeses. I really needed that. I picked up some pepperoni slices and some cheese just to kind of clear my palate and get me some food that I am more familiar with. The second round began the red wines. The first one up was the Goodnight Irene Raspberry Ice Wine with an Almond Petit Four. The dessert was finally something I would consider more dessert-y. It was a dense cake with a pretty strong almond flavor. The wine is Tempo Vino’s annual Valentine’s Wine. It’s a limited edition dessert wine that their website says pairs great with cheesecake….mmmm…cheesecake. Anyway the wine was very sweet which I really like. The raspberry flavor wasn’t overpowering, but just enough. Pairing number five was the Twilight Time Black Cherry Pinot Noir with a Flourless Dark Chocolate Coin with Confectioner’s Dusting. Finally! Chocolate! I ate this small treat in one bite. It was delicious and just what I had been craving. The wine is a light red wine with hints of fruits and berries. This was a favorite of both J and I. So much so we actually considered buying a bottle and the next time we need a bottle of wine, we will probably head back down to buy one. This pairing was the winner of the night for both of us. Great dessert. Great wine. The final pairing was the Tempo Vino Ruby Port with a New York Cheesecake with Roasted Nut Medley. The dessert was not like any New York Cheesecake I have had. It was a small circle that was really hard. Roasted nut medley…not very sweet….not very tasty either. The wine was not my thing. J actually said I made a funny face when I drink it. Too dry for me. Just a personal preference. 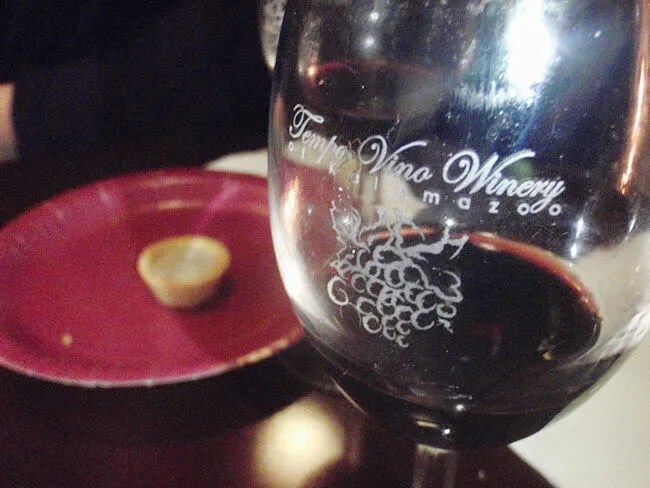 Tempo Vino Winery is a great destination spot in downtown Kalamazoo. I really enjoyed all but one of the wines we had. I knew that J would have a great time and she did. This kind out outing was right up her alley. I really wished there had been more sweet desserts, but my palate is so unsophisticated I’m probably in the minority. It was still a great experience and something I’m really glad we did.